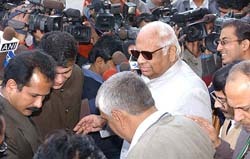 A new political tug of war seems to be on the cards as Lok Sabha Speaker Somnath Chatterjee today took the unprecedented step of offering to resign over the Opposition’s allegations of “tanashahi” (dictatorship) against him. Should Laloo Prasad Yadav have absented himself from Parliament after the train accident? Railway Minister Laloo Prasad Yadav today said that human failure was the prima facie cause for the train accident in Mukerian near Jalandhar and the police was in search of the absconding station masters of Bhangala and Mirthal. “The prima facie cause of the accident appeared to be human failure. Prime Minister Manmohan Singh today said the government would consider the demand for hiking the interest rate of the EPF, hours after CPI MP Gurudas Dasgupta claimed that Dr Manmohan Singh had agreed to increase by 1 per cent the rate from 8.5 per cent. The Government has accepted the Ajay Vikram Singh Committee report which would ensure faster promotions for Army officers up to the rank of Colonel in order to reduce their age profile at the combat level and ensure that they get promotions commensurate to their jobs. Mirthal station master Babu Ram Lal, who is one of the two station masters wanted on charges of criminal negligence which led to the death of 38 persons in a rail accident near Mukerian on December 14, was arrested from Motlay village in Kangra district of Himachal Pradesh today. Alert railway personnel today averted two major train accidents on the Northeast Frontier Railway in Assam and West Bengal.